A close-up and uncompromising view of the Down Platform mens toilets as described in the May 2014 construction update, now with painted guttering. Adding trim items such as window sills and downpipes, as well as final painting, will complete the block. Construction has begun on the main station building at Goulburn. This will be a big project as it is a very large building. The main entrance to the station is from the street on one side and on the other side is the Up platform. Rather than being one large building it is actually a series of different buildings located adjacent to one another along the length of the main platform, and these buildings have grown and evolved over time. We have chosen to model them as a series of smaller buildings just to make things more manageable for us while constructing and installing it. 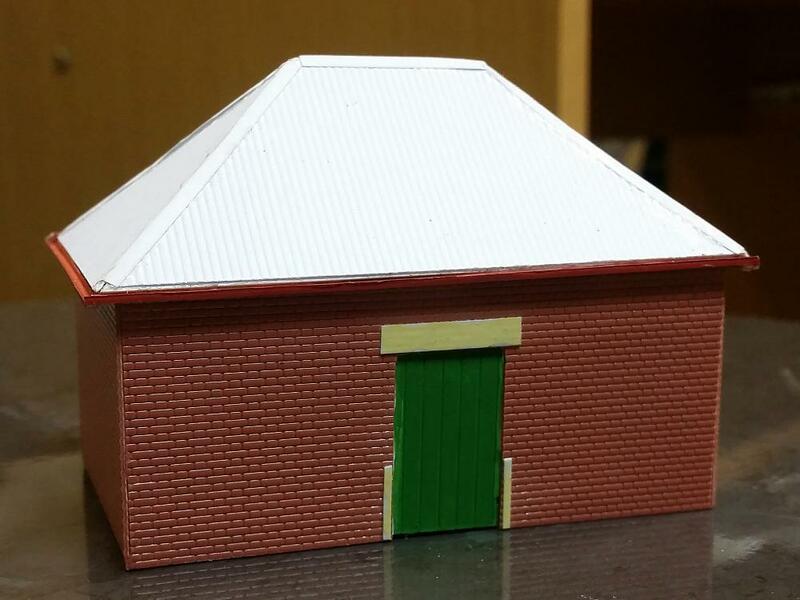 Most of these buildings we will be constructing by first building a shell from plain styrene sheet, and then cladding this in the appropriate material such as embossed brick styrene sheet or corrugated cardboard. This will give the buildings some strength and help to keep the walls straight and the buildings square. We will add internal walls and roof supports as necessary to help with this. One of the Up platform buildings showing the construction method of a styrene shell with internal bracing and supports used to keep the structure aligned and rigid. At the country end the furthest building is a small non-descript brick building with green timber double doors on the street side and another set of similar doors on the platform side. There is no indication what this building was used for but we assume it was some sort of luggage or small parcels building. 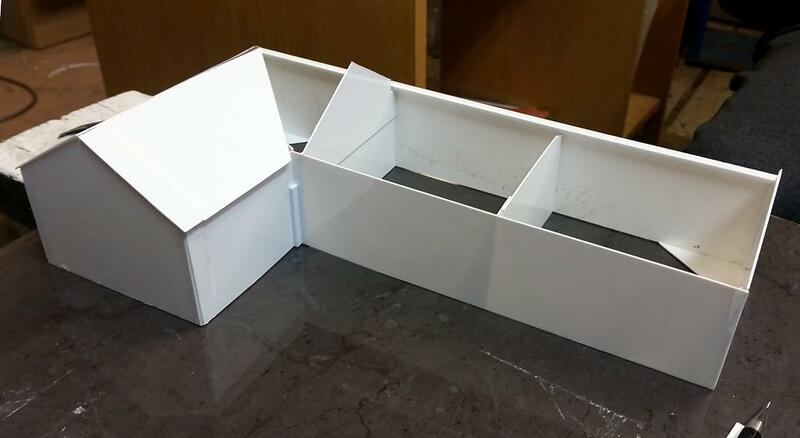 Plastic brick sheet, reinforced on the rear side with square styrene strip at the edges and openings, form the walls. A hip roof was made from plain styrene sheet, to which corrugated cardboard was overlaid. Scribed styrene was used to represent the timber doors on both sides and very thin plain styrene sheet was added to represent the concrete lintel over the doors and the steel edge protection on either side of the doors. Gutters were formed using small styrene C-channel. The small brick building on the Up platform which was presumedly used for storage of luggage or parcels. At the Sydney end of the platform is a large L-shaped building that was used as the refreshment rooms and supporting facilities. 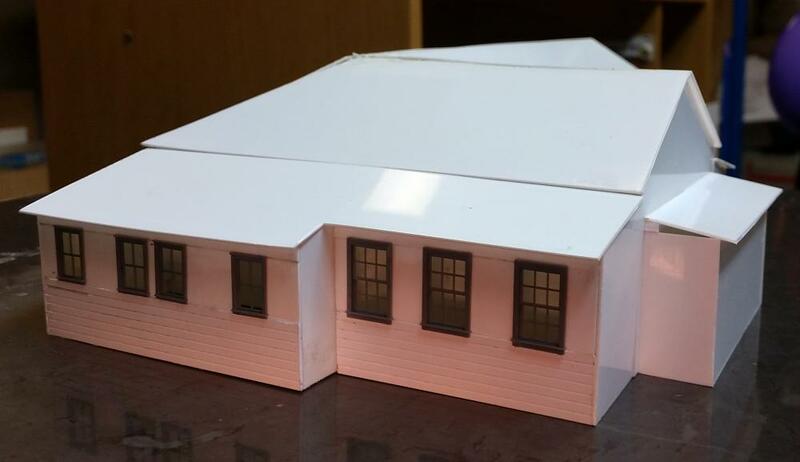 The building is clad mostly in corrugated iron so on our model we built the plain styrene shell to which we will be adding corrugated cardboard to most of the walls and the roof. Some smaller additions to the building have been added over time of which the lower part of the walls is clad in timber weatherboards. 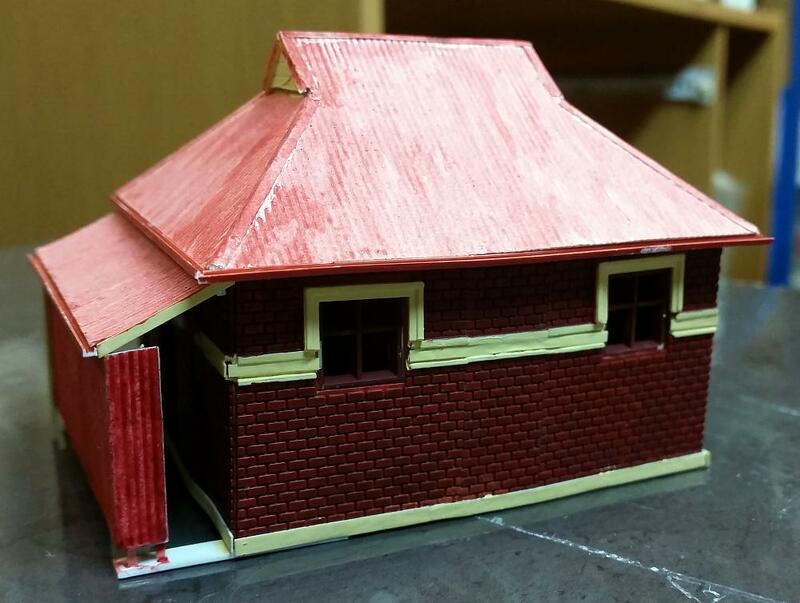 We constructed these walls using scribed styrene sheet for the weatherboards, and added plain styrene sheet for the walls above the weatherboards. Appropriately sized Tichy windows were inserted between the pieces of plain styrene. Each wall was constructed flat on a piece of glass and glued using MEK. When finished the wall was then flipped over and styrene splice pieces were added across the back of all the joins for strength. Side view with timber weatherboarding from scribed styrene and wooden window frames from moulded plastic. The main building at the front and centre of the station entrance is a relatively ornate structure. We have looked into different ways to model the various portions of this building such as the mouldings around each of the windows and doors, the quoins at the corners of the building, and the corbels along the top of the walls where they meet the roof decorations. We thought of building a master of each item that we wanted then using this master to create a mould and then producing as many castings as we needed - this would be costly and time consuming. We looked into using laser etched cardboard - this would be quick and fairly cheap but we decided this would not give us the level of detail that we are after. We also considered 3D printing and our initial investigations showed this would be fairly quick but costly but would give us terrific detail. 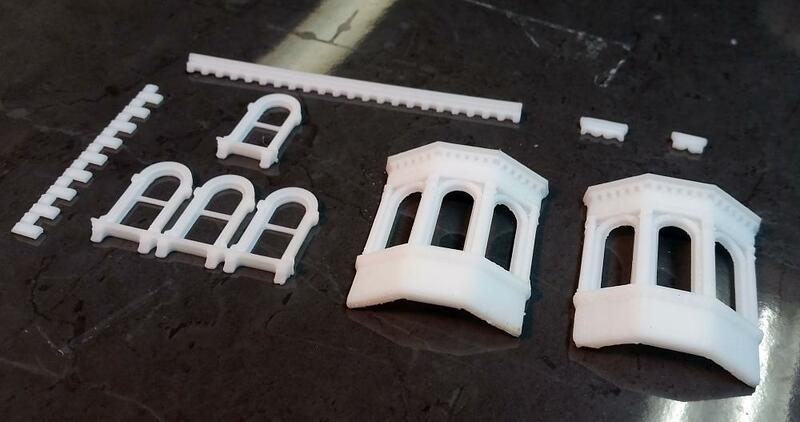 Various detail items for Goulburn's main station building that have been made with a 3D printer. In the end we decided to go with 3D printing of the items and have started getting some of them produced. So far we are very happy with the raw results and we will see how they go when we paint them up and start to install them on the buildings. Items printed so far are window sills (two different sizes for the island platform buildings), window mouldings, corner quoins, strips of corbels, and the two bay windows for the front of the main building. 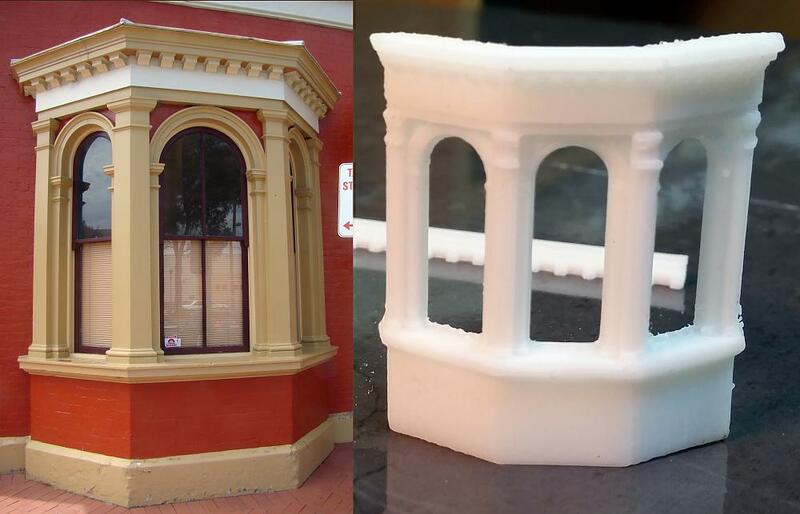 One of the bay windows at the front of Goulburn's main station building with a 3D printed rendition alongside.